WHY any church?" I asked myself in the fall of 1926. "Is religion, after all, the opiate of the people? Is there any reason, any purpose for religion or for churches? If so, which is the one true church? Why so many religions on earth if there is only one God? Why so many differing sects and denominations in traditional Christianity when there is only one Christ?" Although I had never experienced any special religious concern, I had been reared from infancy in a respected Protestant church — until age 18, when my thoughts and energies were devoted to a business career in which I had started out with unusual success. Then, at age 31, I was doubly challenged on a biblical question and on the theory of evolution. I had been angered by the epithet from a fresh-out-of-college sister-in-law, "Herbert Armstrong, you are ignorant!" I had expressed the opinion that I did not accept the evolutionary theory, though I was somewhat familiar with it. This hypothesis was then rapidly gaining complete acceptance as the basic concept in all levels of education. But "ignorant!" I was too proud to accept that accusation. Also I had been deeply disturbed by a biblical challenge contrary to a teaching that I had unquestionably assumed from boyhood church upbringing. There was a biblical relation between the two challenges, in the book of Genesis and others. But first, I delved into the writings of Darwin, Huxley, Haeckel, Chamberlin and other evolutionists. Soon my head was swimming. Their arguments appeared very convincing, as indeed they must be to have won the acceptance of higher education. For the first time I began to wonder, "Does God exist, after all?" I had been reared from infancy to assume the existence of God. Suddenly I realized I had seen no proof, but had accepted without question what I had been taught. Today I know that most people believe whatever they have been taught — what those around them believe. College students today accept the evolutionary theory as fact because they are taught it. They would be considered ignorant by their peers if they did not, like sheep going to the slaughter, assume without question or proof the popular "in" thing. Few realize why they believe the things they do. Now I had to be SURE! I had to see PROOF! My underpinnings were slipping away! I began to realize orthodox Christianity does not explain the purpose or meaning of life — the amazing paradox of awesome human progress amid appalling human evils and retrogression! I found the Bible to be like a jigsaw puzzle. Such a puzzle may consist of a thousand variously shaped pieces. It requires some time and patience to put the pieces properly fitted together, but then one has a beautiful and clear picture. On any one subject, I found many scriptures scattered here and there through the Bible, but when put together, each in its own context, the particular subject or teaching emerges clearly. Each such individual subject or teaching in the Bible may itself be compared to a jigsaw piece. And when put together properly with other subjects, the WHOLE TRUTH ABOUT MANKIND EMERGES — who and what is God the Creator, as he reveals himself — what and why is MAN — what is God's overall PURPOSE — what is man's incredible potential — why such human distress, unhappiness, evil and violence, and why such retrogression accompanied by such amazing progress and human accomplishment? Religion gave this unhappy world no hope. Education had no answer. Governments had no solution. Science gave no deliverance, but instead has now produced the weapons of mass destruction to destroy us all — every man, woman and child on earth! My in-depth study and research PROVED the reality of the living Creator GOD, and that the Holy Bible is in fact God himself speaking — revealing himself and spiritual knowledge to those who, through his Spirit, are able to comprehend. And now, at age 91, through his living Word, God has opened my eyes clearly to UNDERSTAND why mankind was created on earth — how this violent society came to be developed — why Jesus Christ said: "I will build my Church" — how the professed Christian church jumped the track — and which Church, even to this day, is the same original true Church Jesus Christ did found more than 1,950 years ago! Yes, I found, finally, the one true Church. And I found WHY it is, and WHAT it is — and how and why so many differing sects of it developed. Yes, and how a WHOLE WORLD, even as the Bible says (Rev. 12:9), has been deceived — and very soon, now, shall be UNdeceived and delivered from its confusion, violence and suffering. 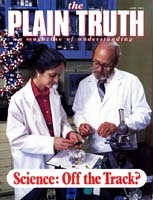 In the next issue of The Plain Truth I make it all plain in the eye-opening article "Where Is the True Church?"